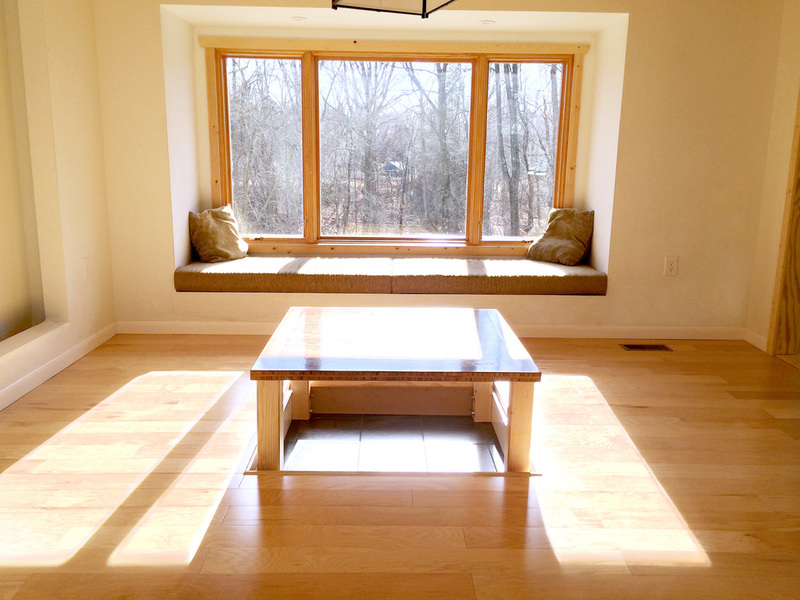 Passive Solar Design - Daniel Krienbuehl Contractors Inc. Passive solar is harnessing the sun's energy to reduce the need for mechanical heating and cooling. It increases energy efficiency and comfort in the home by adding insulation and improved ventilation. 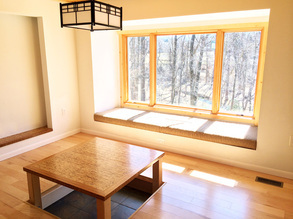 In a passive solar house, the sun's heat is absorbed in the winter and repelled in the summer. This method of heating and cooling is highly efficient because it utilizes the sun's energy to distribute heat throughout the house. In order for passive solar to work, a house must have large south-facing windows, roof overhangs, and insulation that is continuous from the foundation to the roof. The large windows are designed to take advantage of the lower winter sun while roof overhangs are positioned to block the higher summer sun from reaching into the house. Once a house becomes nearly air tight through improved insulation, air ventilation also becomes necessary. It's a great upgrade that fills the home with sunshine, warmth, and helps bring the outside in. Many houses qualify for a passive solar design upgrade like this! 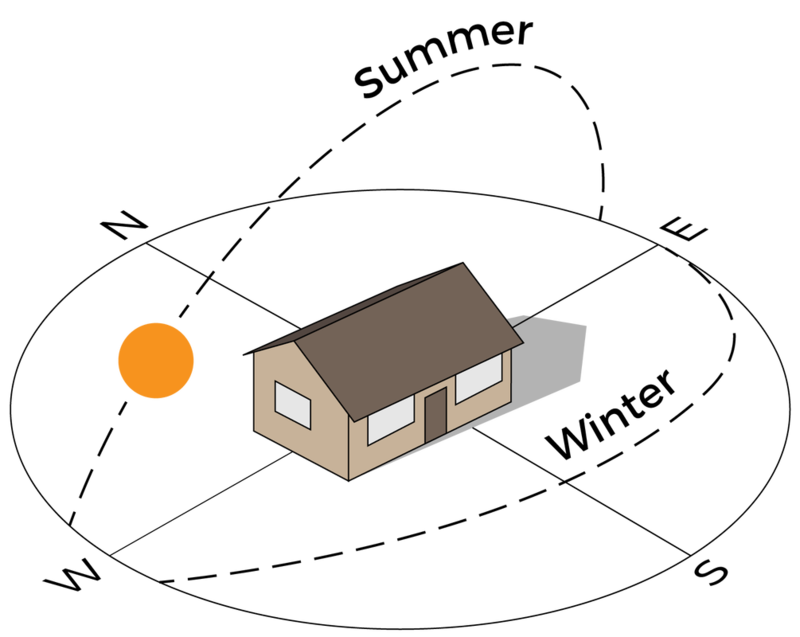 For passive solar to work, the house must be orientated in a south-facing position. Here we can see the relationship between a passive solar house and the sun. On a typical summer afternoon, the sun’s steep angle will not be able to heat the house because of the long roof overhangs. 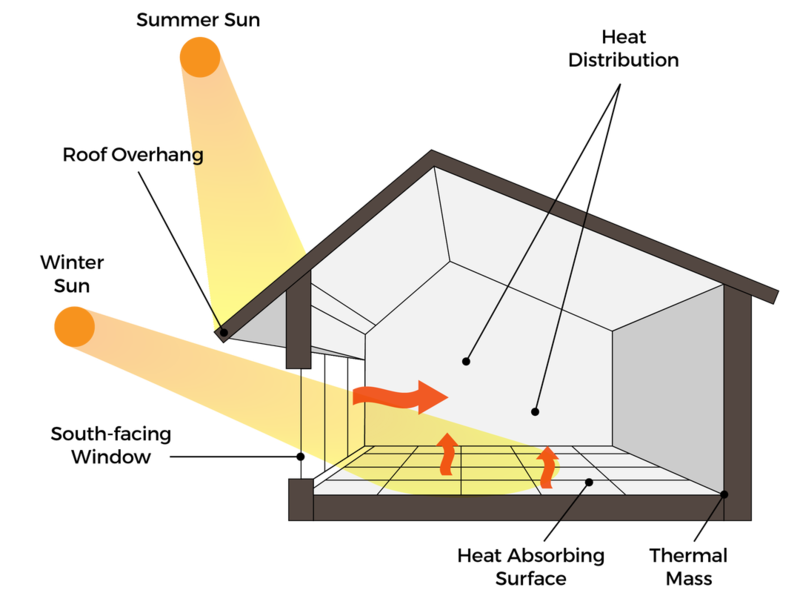 In the winter however, the sun travels across the horizon at a much lower angle and reaches into the house through its large windows to warm the surfaces inside. Due to these shifting sun patterns, days are much shorter during the winter and much longer during the summer. Techniques of passive solar building design were practiced for thousands of years, before the advent of mechanical heating and cooling. Fully developed solar architecture and urban planning methods were first used by the Greeks and the Chinese. Roman bathhouses had large south facing windows, allowing sunlight to naturally warm the spaces. 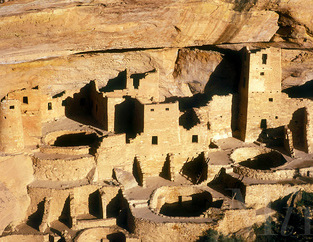 In many early civilizations, architects developed techniques for retaining heat from sunlight during the winter and maximizing shade during the summer. This cliff dwelling built by the Anasazi people soaked up the sun in cold months and was almost fully covered by shade when summer arrived. Here we are looking at the south side of a house that was built in 1966. It is a true masonry structure with bricks on the outside and center blocks on the inside. Our plan was to cut larger openings to accommodate bigger south facing windows and improve shading by adding overhangs. To add insulation to the walls, we used a system called the (EIFS) exterior insulation and finishing system. It applies directly to the existing brick. A two-coat stucco finish that applies on top of the insulation foam board. We applied a 5” thick polystyrene foam on the exterior, covering the entire house from side to side and from foundation to attic. The wall thickness increased to 14 ½”. With this new wall system, the brick and stone move to the interior of the house, acting as thermal mass. In passive solar design, thermal mass helps retain the warmth gained in the winter and helps keep the house cool in the summer. Each year on December 21st at 12 noon, the sun reaches its absolute lowest point making it the shortest day of the year. This day is known as the winter solstice. 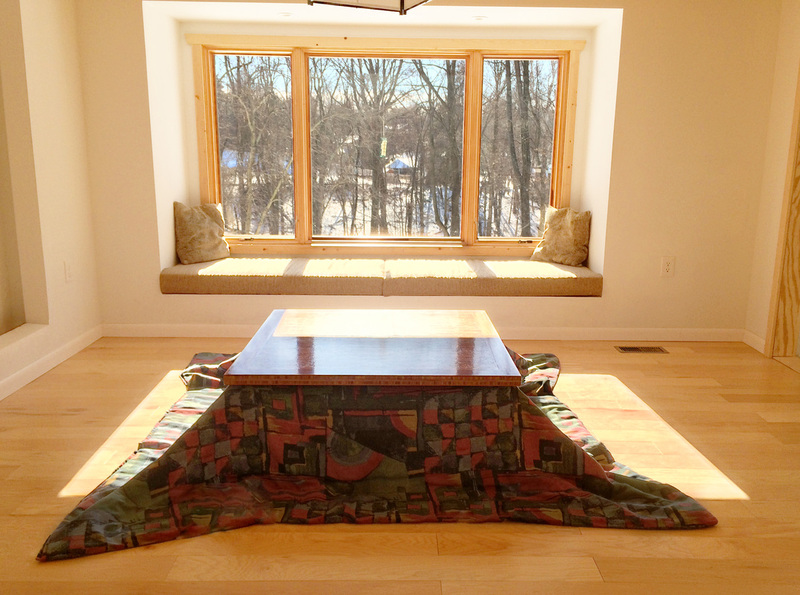 During this time of year, the sun's rays reach deep into the house and help create naturally warm surfaces. The overhang shadows are very small and the sun is able to shine directly into the interior of the house. In the winter, a sun-filled home is a healthier and more comfortable space to live in. As the days get warmer, the sun's angle becomes steeper, providing less heat and a reduced amount of sunlight. On February 7th, the amount of sun entering the house has been reduced by nearly half and on March 13th there is even less. Each year on June 21st at 12 noon, the sun reaches its absolute highest point making it the longest day of the year. This day is known as the summer solstice. During this time of the year, overhang shadows are very long and the sun is not able to shine into the interior of the house. Our ancestors understood the importance of the orientation of all buildings and windows. Utilizing natural energy sources, such as the sun, has benefited people in the past and will play an important role in the future. Modern science provides us with better insulation, ventilation, and testing equipment than our ancestors had. There are things we can learn from people who lived long ago. Not everything from the past is good but maybe our fast-developing advanced society will benefit from revisiting how things were done long ago. Today, energy is cheap and we do not concern ourselves much about turning our thermostats up or down. That may not always be the case as non-renewable resources will slowly dry up. Our ancestors did not have advanced science. They relied on faith and time-tested traditions. We should not totally abandon our ancestors but bring back some of their faith and traditions and see how we can revive them by using modern science.